As a long-time fan of George Miller’s Mad Max trilogy, I’ve been waiting with mixed feelings since Mad Max: Fury Road was announced a couple of years back. A lot has changed in filmmaking and distribution in the thirty years since Mad Max: Beyond Thunderdome was released – costs have soared, computers have become the primary tool for creating the kind of visual spectacle which Miller accomplished with real cars and stunt people quite clearly risking their lives. In fact, the way the business is now run, it’s all but impossible to create those kinds of stunts for real these days but the substitution of CGI facsimiles of action can never generate the kind of visceral power which made The Road Warrior the greatest action film ever made. At the same time, CG has pushed filmmakers deeper into creating “impossible” action. The results are too often cartoonish and unconvincingly exaggerated. 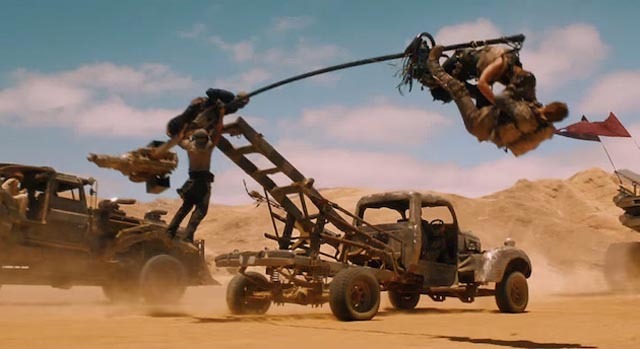 The trailers for Fury Road left me uneasy as they seemed to emphasize this kind of computer-enhanced action, which would completely undermine the sense of physical reality which made the original films so remarkable. Well, I saw Mad Max: Fury Road yesterday evening and my feelings remain mixed. Some of my fears have been allayed, but other aspects unexpectedly left me disappointed. Yes, there are (for my taste) too many obviously CG-enhanced shots – the seething crowds in the early Citadel scenes have the synthetic computer-look all too familiar since the massed battles of the Lord of the Rings trilogy. Particularly in the early stages, CG is used to create epic landscapes which don’t look quite real (the huge dust storm in particular). But once all this has been established, Miller begins the real work of staging large-scale vehicular mayhem. Yes, there are obvious CG enhancements, but there are also the familiar crazy driving stunts which are the essence of the Mad Max universe. There are also quite beautiful stretches, particularly the arduous trek across a plain of mud which stands in contrast to the endless dry desert vistas (shot this time in South Africa rather than Australia). Additionally, the vehicle design is the best seen in all the films, with everything cobbled together from bits and pieces of other vehicles in inventive ways. There are impressively staged action sequences, capped with the final half hour which evokes the climactic chase of The Road Warrior without slavishly imitating it. For the Max fan, this final stretch allays almost all doubts and stands as a reward for the thirty-year wait. Perhaps the biggest surprise for me was the weakness of the film’s script. The Mad Max films have all been essentially simple, linear narratives, accumulating into a lean epic of loss and redemption. Max, having lost everything that mattered to him, wanders alone in the wilderness, but eventually finds himself pulled back towards his own sense of humanity when he (initially) reluctantly gets drawn into the struggle of good people fighting to survive in a violent world. Like the quintessential western hero, he can see the value of community although, given his past, he is unable to rejoin it. He serves a desperate temporary need, but in the end must depart to wander again. This pattern is repeated here in Fury Road. But in the earlier films, director and co-writer Miller was able to add the texture of character to events – yes, everyone involved is pretty much an archetype, but each is individualized and given emotional weight, justifying Max’s involvement. The new film offers very little of this. It also doesn’t establish Max and his existential situation before jamming him into the new set up. In the first couple of minutes, he is captured by marauders and taken as a slave to the Citadel, an oppressed community ruled by a vile despot named Immortan Joe (Hugh Keays-Byrne, Toecutter in the original Mad Max), who controls the supply of water and keeps a harem of the fittest young women to breed children for him, while he maintains power with an army of “warboys”, a tribe kept in thrall by promises of a blissful afterlife in Valhalla if they sacrifice themselves for him. Max is provided to one of these sickly soldiers as a “blood bag”, tied to Nux (Nicholas Hoult) by a chain and a tube which feeds his blood directly into the boy’s veins. When Joe’s number one lieutenant, Imperator Furiosa (Charlize Theron) steals a huge fuel truck and escapes with five of Joe’s brides in an attempt to take them to freedom in “the green place” to the east, where she was born, Max is strapped to Nux’s pursuit vehicle. From that point on, the film is almost continuous action with a few quieter moments during which trust is built between Max and Furiosa, Nux is brought over to the cause and everyone has to make choices about where and how they want to place their allegiance. But despite the impressive staging of the action, the characters never really create a deeper involvement for the viewer. The villains here — Immortan Joe and his allies from other tribes — lack the presence of those in the earlier films: Toecutter in Mad Max, Wez (Vernon Wells) and the Humungous (Kjell Nilsson) in The Road Warrior, and Aunty Entity (Tina Turner) in Beyond Thunderdome. Visually spectacular, Fury Road remains stubbornly superficial and perhaps the biggest cause for this is the usually reliable Tom Hardy in the title role. Hardy is an intense actor with a great deal of experience in violent roles, but here he simply can’t fill Mel Gibson’s shoes. His performance is flat and uninvolved, giving the other actors little to play off, although Theron tries hard – in fact, she becomes the lead by default, with Max as an almost-silent sidekick. Miller attempts to fill the personality vacuum with some flashy moments in which Max’s memories break through in images of his dead family and others he failed to save from brutal deaths in the past, but for the most part these just bounce off the blank wall of Hardy’s inexpressive performance. And so the film never achieves the mythic resonance of the earlier trilogy, although Miller at 70 shames most current directors with a seemingly effortless display of spectacularly visceral action filmmaking. 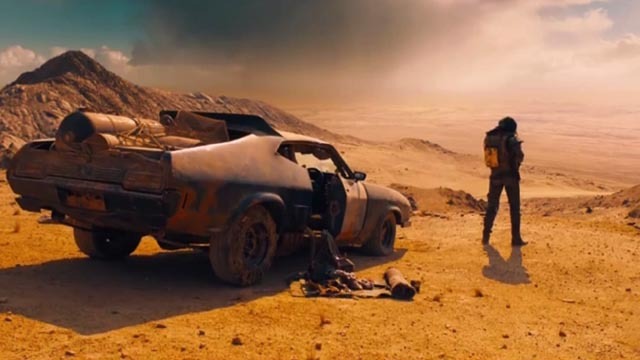 For fans of the genre, and fans of Mad Max in particular, Fury Road is a bittersweet return to this bleak post-apocalyptic world.